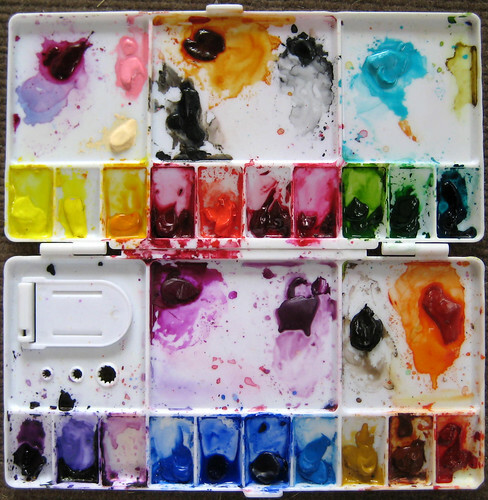 I have just started using the original Van Gogh Watercolour travel kit, but the problem I find is that the paints stick to the palette when you close it, then dry and remain stuck to the "lid". Did you experience this, and how did you solve it, other than removing the paint and only putting a little of the new paint it??? JD - good question.... It's been so long since I used this in its original form. I think it was my 1st watercolor kit that I bought maybe 5 years ago? I have a vague recollection of the paints sticking to the lid. I can only speculate but it might be because of the paints specific composition. Are you allowing the paints to dry before closing the lid? Nice way to repurpose a cool piece of kit. I have this set, and one thing to keep in mind is that although Van Gogh paints are "student" grade, they are all rated highly permanent/lighfast and the colors are quite nice. These are not your cheap Pentel, Reeves, Maries, etc paints. cheers and thanks for the reviews you post.